The famous chef and cookbook author, James Beard, once said “Food is our common ground, a universal experience.” And nowhere could this be noticed more than at a community food swap. 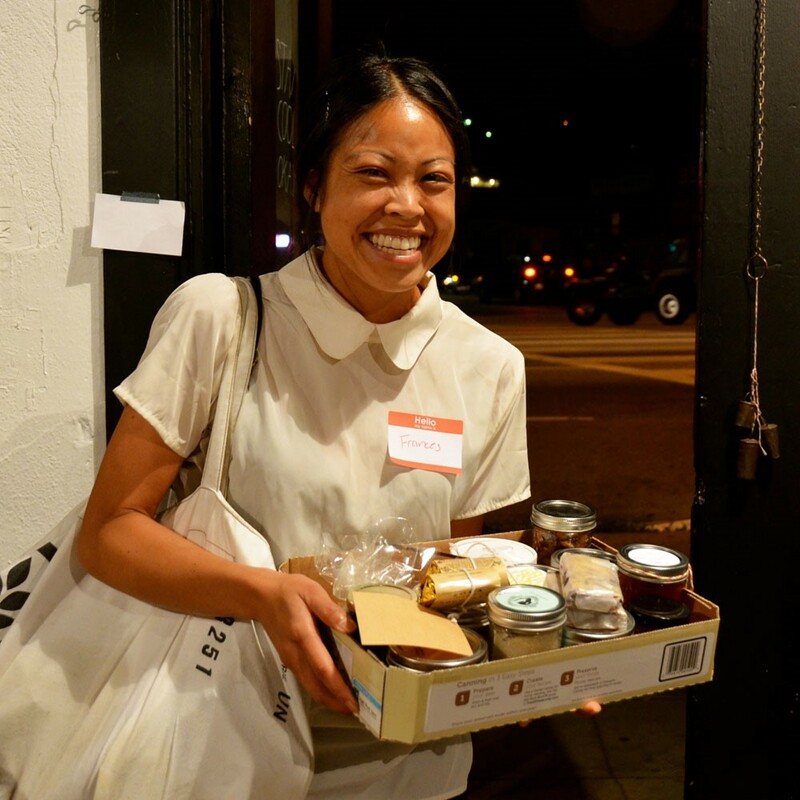 Have you ever thought about hosting a FOOD SWAP? I read an article about doing just this in my latest issue of Mary Janes Farm magazine. 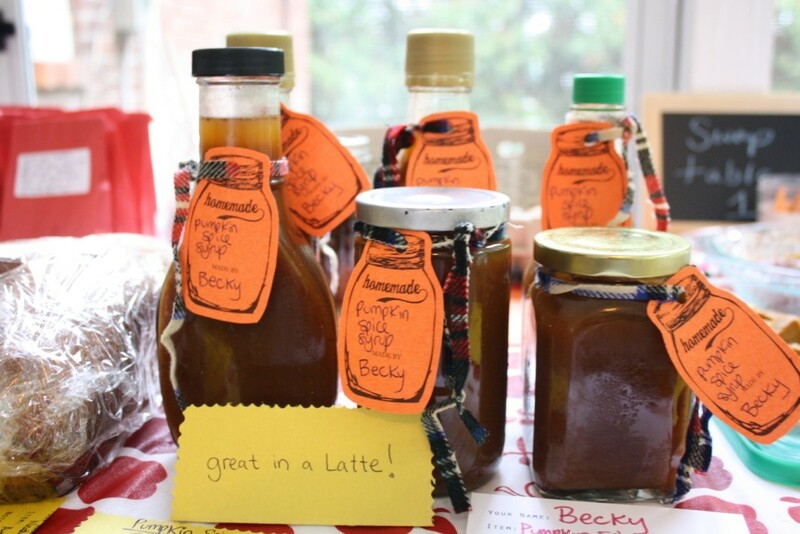 The idea of meeting my neighbors to share our homemade and homegrown foods was so inspiring that I’m seriously considering holding a food swap in my own area. The end-of-summer gorgeous weather we have this time of year would make for a perfect outdoors event. 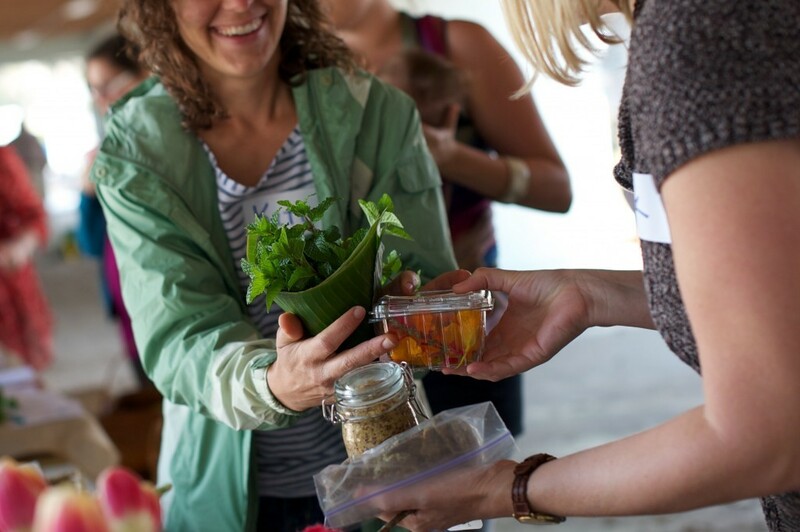 In a food swap, no money changes hands and participants simply trade foods they made or grew. One person might bring homemade bread, another several jars of fruit preserves, and another might bring herbs from their garden. Bring 20 freshly baked something or other to the swap and you might go home with lemon curd, red velvet cake, lavender and cocoa butter beauty bars, handmade pasta, salsa, shortbread, and more. Swaps allow direct trades to take place between attendees, e.g., a loaf of bread for a jar of pickles or a half-dozen backyard eggs. 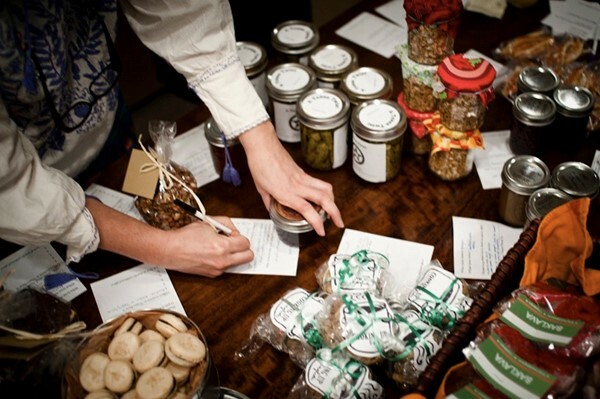 Swap events can also include item sampling and/or a potluck as an immediate food-sharing component. It's a way to diversify your pantry, for sure, but even more than that, it’s a special approach to bringing people together to share the bounty of their labor and creativity. The conversation can turn from gardening tricks to cooking smarter, trading canning tips, and sharing recipes. In fact, trading recipes is one of the best parts of the event, so be sure to ask each guest to include theirs with their offering. The energy and enthusiasm runs high as you bring people together who share a passion not just for eating, but for making their own food. You can start by inviting folks you know in your neighborhood, church, school PTA, at work, or you can even open it up to your community. You can host this event solo or partner up. You can hold it at your home, in a park, or perhaps at your church. A friend who decided to do this got permission from the little town where she lives to hold it in the cul-de-sac of her neighborhood. She invited a 4-block reach of her neighbors—lots she knew, but even more she didn’t. Keep in mind that swappers will be examining and picking up your goods, so be sure to package them in a way that protects the food and makes it clear the amounts you want to swap. When applicable, it is recommended that you include storage and shelf life information. It’s also a good idea to include a list of ingredients (or the recipe) attached to the package. This way people know for sure if there are allergy issues. And if possible, you should also bring samples for others to try. Swaps usually last about two hours. · The first 30 minutes of the swap are devoted to sign-in, set-up, and greetings. Swappers fill out name tags and swap sheets and set up their wares on the tables. · The next 30 minutes to 1 hour are for everyone to walk around, examine, and sample items from the other swappers. Swappers will write their names and items they brought on the sheets for any items they would like to take home. · The final 30 minutes are when all the swapping actually happens. Everyone goes back to his or her original sheets of paper, looks at the offers, finds interested offerers via their name tags, and swaps. · All swap participants adhere to an honor code of using the highest cleanliness standards in their own kitchens and gardens to prepare their swap items. 1. By participating in this event, you are acknowledging that the food items being shared are not necessarily prepared in commercial kitchens or spaces inspected by any government agency. 2. By participating in this event, you are also acknowledging that you will use the highest standards of safety and cleanliness in food preparation. 3. By participating in this event, you assume all liability; specifically, you agree to not hold liable food swap hosts, swap venue owners/providers, or other swap participants. If it sounds intimidating, the advice from seasoned swap-holders is not to worry. Swappers are quite friendly and it’s all done in a spirit of fun. So whether you hold a swap with 5 people or 50, you'll come away with new foods and friendships. To learn more about how to do this, you can visit the Los Angeles Food Swap site (www.lafoodswap.com), which also includes links to existing food swaps around the world (a new one seems to pop up every day). Or go to www.foodswapnetwork.com to see if there’s anything happening near to where you live. What a cool way to celebrate good food and good community!